Each STUDY PLAN contains ALL the construction drawings for each material - STEEL & ALUMINUM, as applicable to the particular boat plan - with up to 25 sheets per plan! Lists of materials - Technical information - Numerous construction drawings are all included. Plus you will receive a DETAIL FOLIO showing how to make many of your own boat fittings, lists of materials and equipment are all included plus all technical information, numerous construction drawings and written building instructions are all included. You can view & print the drawings in full or in sections. BUILDING PHOTOS are included in the plan package. PLUS you receive a FREE (value 79.95) e-book BUILD YOUR OWN POWER BOAT .. Only available at this price if you order off this page. Another TY 620 plus TY 520 moored in Singapore. 2017- Hi Bruce, just finished a refit of the Saloon and Galley on our TY520. Developed from our proven Trawler range - This kit is for the serious cruiser or 'live-aboard'. The displacement hull is capable of cruising at around 8 to 14 kts depending on horsepower of the engine(s). This design is well suited for extended cruising in luxury. The standard version has side decks however we can arrange other versions with either single side deck or with full wide-body salon. TY 620 - Bruce, I had reply from ROYAL YACHTING ASSOCIATION on the plan evaluations. 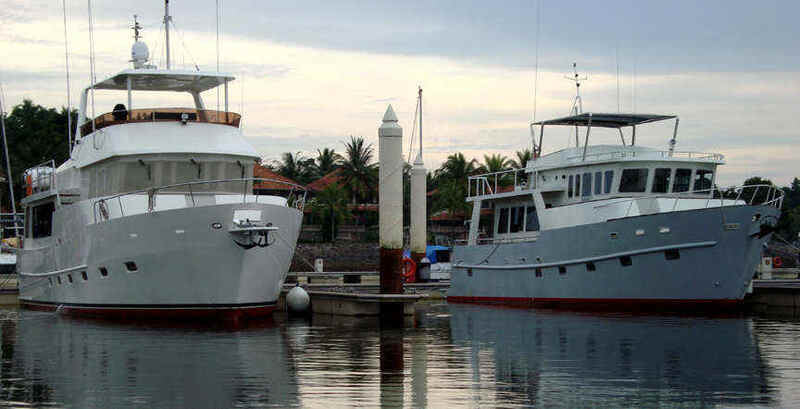 They have been very quick and say they have no concerns about suitability for Design category A (unlimited offshore). The ROYAL YACHTING ASSOCIATION made a nice compliment on the quality of your plan information. Voyager TY 520 Kit or Cutting files & boat plans. CUTTING FILES AVAILABLE FOR STEEL OR ALUMINUM. There is plenty of space to walk around the John Deere and Genset with about 1.75 m headroom throughout the entire engine-room. Six 200amp house batteries plus starting batteries for John Deere, Yanmar and Genset are all under the checkerplate flooring in Sea Crest Marine custom made ventilated battery boxes. We have a 24v system. 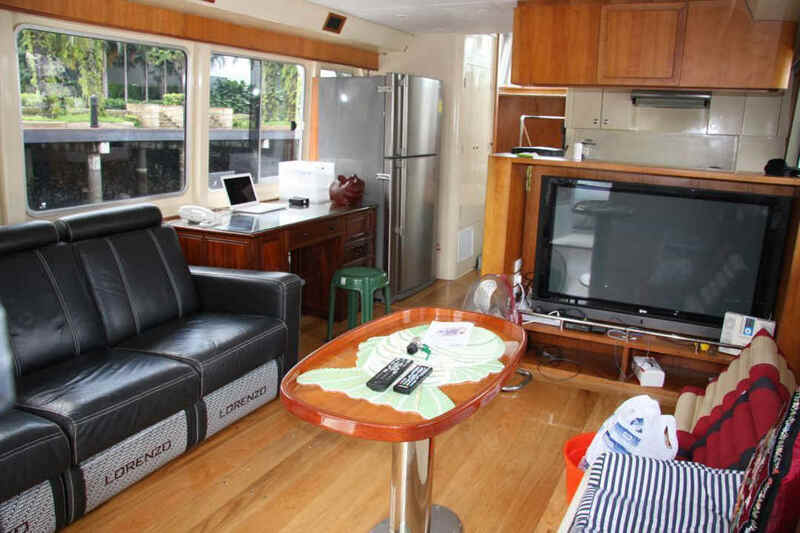 In the lazarette we have washer/drier, chest freezer and a workbench with lots of storage for tools and dive gear. This is what we wanted our TY 520 to look like ! AT LAST THE REAL THING ! DEAR BRUCE, IT'S BEEN A LONG TIME SINCE OUR LAST COMMUNICATAMARANION. 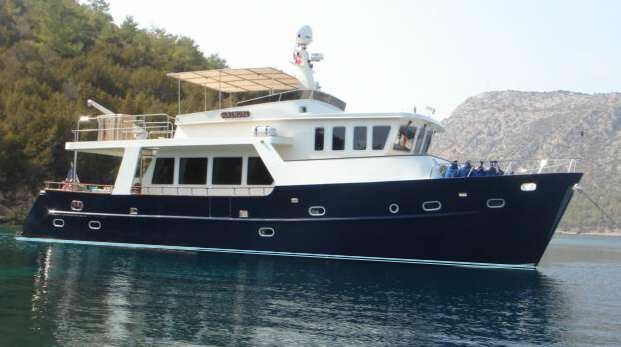 WELL IT HAS BEEN VERY BUSY INDEED BUT FINALLY OUR TY 520 "ANEMONE" JOINED THE SEAS ON 28TH OF AUGUST AND WE SAILED DOWN TO BODRUM FM ISTANBUL IMMEDIATELY. WE HAVE BEEN ENJOYING HER EVER SINCE, WE ALREADY HAVE MORE THAN 2000 MILES ON OUR LOG! 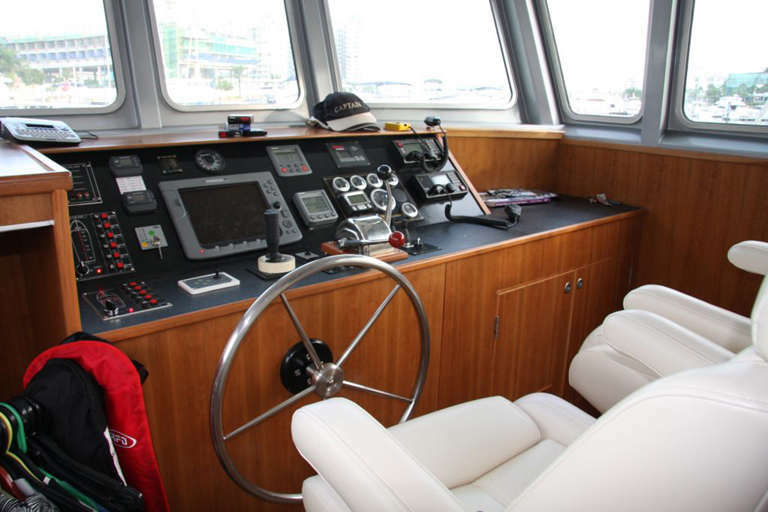 SHE IS A FANTASTIC BOAT, STEADY, WELL BALANCED, VERY COMFORTABLE , SEAWORTHY AND BEAUTIFUL. EVERYWHERE WE GO PEOPLE COME AND EXPRESS THEIR ADMIRATION. "ANEMONE" IS A GREAT TRAWLER, FIRST OF ALL SHE IS A REAL TRAWLER; EVERYWHERE WE GO PEOPLE COME AND ADMIRE HER, ASK FOR OUR PERMISSION TO TAKE PHOTOS. SHE IS NOT ONLY BEAUTIFUL BUT ALSO A VERY TRUSTWORTHY BOAT IN ALL RESPECTS. WE WENT INTO FORCE 7 WINDS AND SEAS, NO PROBLEM SHE CAN HANDLE MUCH MORE VERY EASILY. WE EXTENDED THE FLY BRIDGE PRO RATA WHICH ENABLED US TO PARK OUR TENDER ( 4,30 MTRS ) AND A VERY COMFORTABLE SITTING CORNER FOR MORE THAN 6 PEOPLE. I PLACED A VERY SUFFICIENT KITCHEN ON THE BRIDGE THUS THE LIVING BECAME ENORMOUS, NEARLY 20 SQM. I ALSO ADDED A HUGE STORAGE BOX ON THE FORE DECK, IN FRONT OF THE PORTUGUESE BRIDGE WHICH IS ALSO A VERY COMFORTABLE SETTEE. UNDER THE DECK WE MANAGED TO PLACE 1 MASTER CABIN AND 2 REASONABLE GUEST CABINS ALL WITH ENSUITE HEADS AND SHOWERS. THE FIRST PLATE WAS TACK WELDED ON AUGUST 3, 2006 AND WE SLID HER DOWN TO THE SEA ON THE 18TH OF AUGUST 2007. SO IT TOOK US 1 FULL YEAR TO FINISH HER COMPLETELY I.E. ALL SYSTEMS INSTALLED, ALL FINISHING DONE. Hi Bruce, Thought it was time to send an update. The TY 520 is a week away from completion of the major welding and still looks quite fair....we have followed your instructions to the letter! Voyager TY 520 Kit or Cutting files ... Letter from Ali Cayirlioglu in Turkey. DEAR BRUCE, THE CONSTRUCTION OF OUR TY 520 "ANEMONE" IS PROGRESSING AT FULL SPEED. WE HAVE STARTED AND IT IS AMAZING TO SEE HOW FAST IT GOES. I MUST THANK YOU ONCE MORE FOR THE PRECISION OF YOUR boat plans AND CUTTING FILES. THEY WORK JUST LIKE A "SWISS WATCH". EACH PIECE IS FITTING EXACTLY. EACH PIECE IS TACK WELDED AS YOU SUGGESTED. WE EXPECT TO START THE FINAL WELDING NEXT WEEK AND THE YARD PROMISED TO COMPETE THE JOB BY 20TH NOVEMBER. WE HOPE TO GET HER IN THE WATER BEFORE SUMMER 2007 .. YOU ARE INVITED TO BE OUR GUEST OF HONOR. I WILL KEEP YOU INFORMED ALL ALONG ... KINDEST REGARDS ALI. 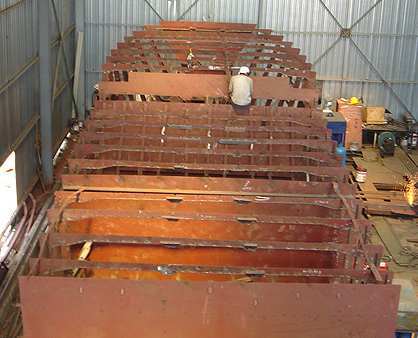 CONSIDERING THAT WE STARTED ASSEMBLING THE JIG ON 1ST OF AUGUST 2006.AS OF TODAY THE WELDING IS COMPLETELY FINISHED , ENGINES, SHAFTS, RUDDER, GENERATOR, ALL TANKS ETC. ARE INSTALLED. WE ARE ACTUALLY WORKING ON THE ELECTRICAL SYSTEMS AND ALL OTHER MECHANICAL WORKS. THE PAINTING IS EXPECTED TO BEGIN IN 2 WEEKS. THANKS FOR THE PERFECT CUTTING FILES. 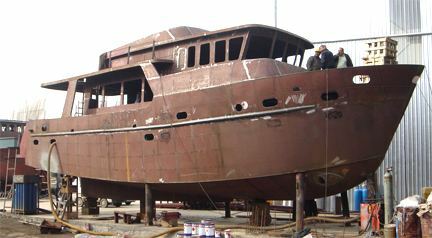 By the way, the TY 620 - 62 foot trawler yacht of Bruce's design that we are currently building is coming along very well. The quality of the kit parts are the best we have ever seen, and as a result, we are saving time in the build. At present, we have 9 welders/fitters working on the boat in three teams. We have almost all of the plate hung in place and tacked up. We anticipate the seam welding will start within a few weeks as there are some details to attend to. 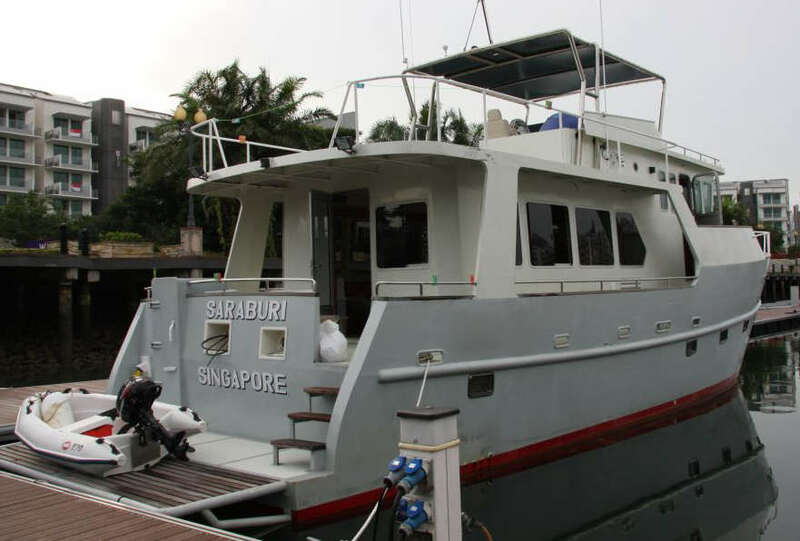 The carpenters employed by boats and Boats are all ex Grand Banks people who where laid off when they closed in Singapore so the quality of the workmanship is first class, they also have their own in house design team so it has been great to see our ideas turned into reality. Hi Bruce, SeaCrest Marine in Bangkok were excellent to deal with. When we left Bangkok we had a sharp 2 metre wave right on the bow for the first 36 hours, quite the opposite from the big following seas that we experienced bringing Rod Steel’s Trawler Yacht 620 down from Korea. The TY520 handled the waves very well indeed. We had a problem with the Auto Pilot hydraulics and had to hand steer for the whole 36 hours so we would have known if the boat was not performing ! Towards the end of the 36 hours as we closed in on the Malaysia / Thai border the seas swung around about 30 degrees from head on and we were still handling things pretty well. No doubt the boat would be improved with Stabilizers but we always felt safe. I have attached some pictures of the Sea Crest Pilot House and Engine room. They did an excellent job. We arrived in Singapore just as they were having their National Day celebrations so we got some good pictures! Very Happy to be back in Singapore and Very Happy with the boat Bruce.